Stellar Converter for EDB is a professional tool that proficiently converts online as well as offline Exchange Server database (EDB) files into Outlook PST files. Performs Single or Multiple Mailboxes Extraction as per requirement. *Download the free trial version to scan & preview your converted mailbox as PSTs. On downloading the software trial, I was able to preview of my mails. So I bought the software as it appeared to work.. I love everything about this utility. Very useful utility for exchange admins to export Exchange EDB file to outlook PST. Why Do We Need EDB to PST? Stellar Converter for EDB can be used while extracting single or multiple mailboxes from Live Exchange Server, extraction of mailboxes from Live Server is not possible without Stellar Tool. The software also assists in smooth migration to Cloud Office 365 and Hybrid Exchange environment. When ExMerge, the Exchange inbuilt utility faces limitations, deploying converter software ensures smooth EDB to PST conversion. Why Convert EDB to PST? The biggest reason behind the need of EDB to PST conversion is backup maintenance. MS Outlook PSTs can be accessed via other email clients too and files in this format are easier to access. Moreover, PST files come with the flexibility of storage support at any user specified location. Thus, users can move their data among machines and access mailbox contents anywhere. Require to Access old EDB Data? While moving to another office branch or a different organization, a user might need to access his emails, contacts, and notes stored within old EDB files. To access old EDB data easily through MS Outlook, Exchange admins can convert EDB files of users to PST format using Stellar EDB to PST converter would be the best way. Need to Archive Data without Dismounting Current Database? Need to offload old Data from a Bulky Exchange server? Each Exchange Server hosts thousands of mailboxes and numerous emails, calendar entries etc. Getting bulky is inevitable. Add to that the need to backup constantly and the process can become a nightmare for any administrator. Moreover, a bulky EDB file runs the risk of corruption. Hence, from time to time, it is necessary to shed some load off from the EDB file by converting old files to PST format and moving them to local machines. This tool acts as an Exchange migrator by helping you to export offline exchange mailboxes directly to Live Exchange/ Office 365, without the need of going through the manual process of reconfiguring users in Exchange. All you need to do is to select the offline users, enter the credentials and export them to a live exchange server/ Office 365. Download Server Console.exe to grant Full Mailbox Rights to disconnected mailboxes. EDB PST converter helps you recover accidentally deleted offline EDB mailboxes that lie within the 'Mailbox Retention Period'. Just launch the tool in offline mode, select the deleted mailbox from the list, save it as PST and later resynchronize it with Exchange server. The application can also recover deleted mailboxes from previously stored offline EDB files. Stellar EDB to PST tool has a unique way of proving its credibility to users. The tool allows users to preview mailbox items before the actual conversion so that they can have an idea of how their data will look after the process completes. You can preview Emails, Attachments, Notes, Calendar Entries, Contacts, and Sent Items etc. You can save the scan information as an image at a desired location on the hard disk for future access. This image file can be loaded into the software at any point of time to complete the conversion process. Stellar EDB to PST converter helps Exchange Admins to quickly select and export Exchange Public Folders to PST format. The converter software enables Admins to cut short the lengthy manual process of exporting public folders, which may or may not result in a complete restoration. Stellar Converter software cuts the time and expense associated with exporting Exchange Public Folders to PST. Stellar Converter software allows users to directly export Public Folders to Office 365 Groups. Since public folders contain project related information shared amongst team members, the data it contains is critical to the success of the project itself Stellar software makes sure that the data contained in public folders are exported to Office 365 Groups with ease. How to convert EDB to PST with Stellar Converter for EDB? The software will scan the EDB file and list the Exchange mailboxes in a tree-structure view. Check the preview of Exchange mailboxes and save them at a destination location. Do I need MS Office pre-installed on the system where I want to save the converted PST files? Yes, MS Office should be pre-installed on your computer prior to saving the output PST files. Why do some mailboxes appear as 'disconnected' after I connect to the Exchange Server? You may have logged on to a client computer, which is not a member of 'Exchange Server' domain. The mailbox store containing the disconnected mailboxes is dismounted. You can mount the mailbox store using Exchange Management Console (In Exchange 2007 and 2010). You are not granted 'Full Mailbox Permission' for a specific mailbox. Can I convert my PUB.edb using this tool? Yes, the software supports conversion of 'PUB.edb' file to Outlook data files. However, this conversion can be done only in the offline mode. Can I save some email messages as 'EML' or 'MSG' files using this tool? 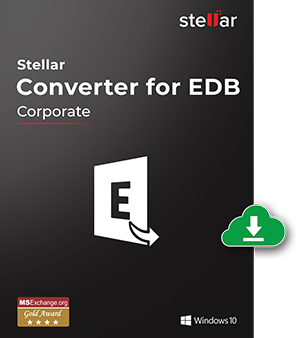 Yes, Stellar Converter for EDB facilitates conversion of emails to 'EML', 'MSG', or 'PST' files. Can I perform online conversion using Stellar Converter for EDB, if I do not have administrative rights? No, to perform online conversion via Stellar Converter for EDB, you must connect to the Domain Controller as an Exchange administrator. If you do not have administrative rights, you cannot perform conversion in online mode. Can Software save Single mailbox to PST or Live Exchange Server? Yes, you can save a single mailbox in online mode by selecting the 'Connect to single mailbox' option. Is there any limitation on the number of mailboxes which can be converted? No, you can convert unlimited mailboxes to PST, Live Exchange Server and Office 365. Does the software provide the guarantee of EDB to PST conversion? We provide demo version to check the preview of Exchange database files (EDB). If the software shows the preview of Exchange mailboxes in the demo version, then it guaranteed that software will convert EDB files into PST file format. Note: We strongly recommend to users to run the software demo version to check the product capability before purchasing the software. How much time does the software take to convert the EDB file? Conversion time heavily depends on the size of EDB files and mailboxes to be migrated. The software efficiently scans EDB file and tries to deliver the best results with original data formatting and folder hierarchy. What if I face any problem after the EDB file conversion? If you face any issue during the EDB file conversion or after the conversion, you can contact our support team. We provide free 24*5 free technical support.